When I was young, I needed glasses. But I didn’t know I needed glasses. I had gotten used to not being able to see very well. I spent second and third grade squinting at the chalkboard during class. I would try to sit close so I could see what was written on the wall. Amidst my struggles with vision, one night as we watched television, an episode of Little House on the Prairie aired. In this episode, the character Mary was squinting and pulling at her eyes. She needed glasses. I turned to my Mother and told her, I needed glasses just like Mary. She said, surely not, as I was only in fourth grade at the time. I told her I was doing everything Mary was doing within the episode. A couple of weeks later my Mother got me an appointment to see an eye doctor. I had never seen an eye doctor before. I was truly an “eye-opening” experience. Every time I went to my family doctor, the Doctor spent most of his time talking with my mother. He would give me a quick look over and tell my mother what he was prescribing to make me better. The eye doctor was very different. He had me sit straight up in an odd chair and rest my chin in a special chin cup. Then he slid circular panes of glass before my eyes. Then he began the calming repetitive litany familiar to all of those who suffer from bad eyesight. “Is this better, or this one? The second one or the first?” Again and again the glass panes slid in place and the litany continued. Again and again, I was forced to choose between this form of blurry and that form of blurry. I was amazed at a dawning realization that came over me. Through it all, I was in charge. These glass plates would change, would flip, and would slide into place because of the nimble fingers of a doctor who listened patiently to a ten year old. After countless queries of “this… now this,” the glass panes slid into place with a pleasant metallic click and I could see. One week later my glasses arrived. I was so happy when I went outside and I saw the trees. The trees had leaves again. For many years, distant trees had only been crowned with a glory of impressionistic green. Now the leaves were back, because I had new eyes. These eyes saw things crisp and clear. These eyes were open and joyous and everything was new. When I was a child, I knew sweat and thirst. In Oklahoma, a summer day would often be 100 degrees in the shade. My sister, my brother and I would work for hours in the blistering heat, We would work either out in the vegetable garden or in my father’s flea-market stall. We were dressed for the heat. We wore long-sleeved cotton shirts, wide brimmed hats and work gloves. I would sweat so much that when I went inside for lunch the oil and sweat from my face could double as a soap for my hands. This was a good thing as the restroom at the flea-market often did not have soap to wash one’s hands. I was probably eight years old when I begged for water one day. My Father said I was just goofing off and told me to get back to work. I told him I felt shaky and dizzy. He threw me the garden hose. I did not want to drink that water. The water rushed out warm and musty from the hose. It tasted horrid, but I drank it. I was so thirsty. Life was very hard and we worked all day. But at night’s my sister and brother and I would often play games. We would play checkers, Monopoly or Operation. I really liked Operation. I did not play by the rules. I rarely used the cards or gathered money. I just liked to see if I could “operate” without causing the little man to buzz. Here too, I would perspire, but this was nervous sweat. I was trying so hard to succeed. I did not want injure my little pasteboard patient with his open metal wounds. I had not thought of those long ago thirsty days for many years, until I painted 73 Cents. Washington, DC temperature does not reach the highs of my Oklahoma youth, but it does get hot in July and August. One day I was painting on my high ladder 20 feet off the ground with no breeze and a temperature of 96 degrees. I began to feel shaky and dizzy, but I had to paint. There was no time to stop. I painted on, becoming ever weaker. I was interrupted in my painting by a voice below. “Hey Miss!” A lady called. “Hey, Miss! I brought you some Gatorade. It is much too hot today to paint without a drink.” I climbed down carefully, my hands shaking as I descended. I smiled and thanked this stranger who was so kind. I chugged down the beverage and felt energy return to me so I could complete my task. I thanked her once again, and she handed me another Gatorade. “Here is another one, if you keep painting you are going to need it.” After saying that she turned and walked away. I was so thankful as I returned to my painting vigil. And it stated “Be Careful What You Ask For? One of our scrub techs who was known to be overly needy called out for a Gatorade to be brought in. Since he just returned to his case from eating dinner my nurse and I was not too worried about his need and decided to keep enjoying our time off our feet for a bit before getting his request. After 10 minutes the request came again. So now we were on the prowl as to how to shut him up. Sitting on the table in front of us was a bottle of Tabasco. We got some yellow Gatorade and a cup of ice. After mixing his drink to look more like orange gator aid we brought it to the room with a straw and gave it to the nurse. They happened to be doing a surgery that required a lot of concentration at that point so the room was really quiet. The nurse placed the straw in his mouth and he sucked down three big gulps. This made me so sad. When I needed a drink as a child my father showed as much care as these co-workers. Perhaps I seemed needy, and I was. I am glad as an adult, a complete stranger was willing to go out of their way to help me. After reading this post on the IHI page. I dug out an old operation game, and I read those cards. Those cards I always ignored as a child. Do you know what one said? 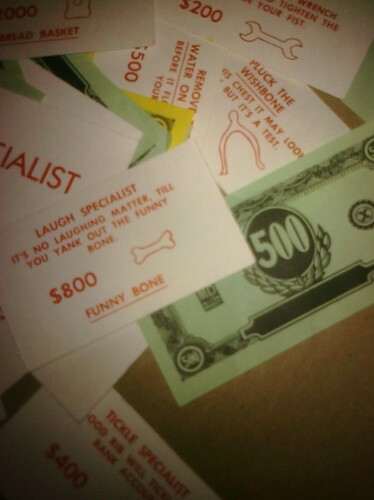 “It is no laughing matter, till you yank out the funny bone- $800. I am glad even as a child I knew to focus on the right thing. The hundreds of dollars and cards with their jokes about surgery were not important things. The important thing was my patient and I would do everything I could to prevent the alarm’s sound during my surgery, even if it was just a game. As a very young child, I drew spirals. I felt at peace when the pencil lead would score the page and the circle turned ever inward. 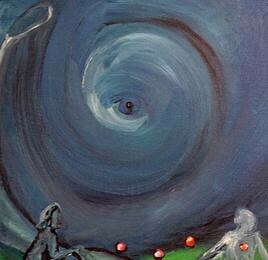 As I grew older, I drew tornadoes, which are just spirals viewed from the side. Many years later, I learned that the Celtic triple spiral represented time, life, and three phases of a woman. But whenever I want to connect with that inner vortex from whence art and love can flow, I start with spirals. And if you ever see me paint onsite at conferences, that is invariably how I begin. Yesterday, I had an opportunity to visit the Center for Green Urbanism in NE DC for a screening of the film Who Does She Think She Is?, directed by Pamela Tanner Boll. I had originally heard about this amazing film from Amy Romano, Associate Director of the Transforming Maternity Care Partnership for @childbirth. Amy, who tweets as @midwifeamy, sent me the trailer months ago as a YouTube link on Facebook. Within this documentary, images of birthing and art coil one upon the other as the tales of five female artists are unspooled. It is a powerful film. I am very glad I got to attend, but I almost did not, for the want of a sitter. I asked Shoshanna, Courtney, Alex, Megan, Miriam, Hannah, and Pete if any of them could sit for a few hours on a Sunday afternoon. All of them were unavailable. This is the point I would have probably given up, if I were just attending and not speaking as well. But as I had agreed to be part of this, I tried one more person. I asked my five year old’s teacher, Emily Stewart, if she would mind sitting. She said yes, and I could go. So I hopped in a taxi and left with another local artist and advocate- Patricia E. Ortman, the founder of the non-profit Girls Gotta Run. As I looked around the room after the screening, I wondered how many artists were not in attendance because there was no one to watch their young children. Supporting the arts in our society requires asking for a lot more than a grant to support the funding of a mural or a public work. It also requires acknowledging the time, sacrifices and emotional energy spent in this pursuit and how that effects family relations. As an artist living in a series of small, carpeted apartments, there was only one place to paint- the kitchen. So my counters were covered in brush bins and paint buckets. My sink filled with paint splotches, and my kitchen apron is an artist’s smock. There was so little space available I could waste none. So when I was not cooking, the oven was a convenient location for paint storage. Fred and I knew to empty it before pre-heating, but I always worried a sitter would just cook my paint. After Fred became ill, people offered to help with chores at the house. One day I left some plastic bins out for a friend to take the artistic things off the kitchen counter. In my mind’s eye, I saw them carefully placing my clay pots filled with brushes and pencils in the neat bins so folks other than myself could cook for the children. I came home to find all my supplies unceremoniously dumped together in the bins. Have you ever read that part in the Bible about the great wailing and gnashing of teeth? That adequately describes my behavior upon seeing my supplies buried this way. My mother-in-law thought I had lost all sense of reason. Why was I screaming and weeping over art supplies, while my husband lay in hospital? Why indeed, was I crying? I could not bear to lose them both. Not my husband and my art--that is too high a price to pay. So as mothers/wives/artists, we must talk of art in hearth and home and how that defines us as artists. As this documentary progressed, I saw scene after scene filmed in the kitchen. I saw women move from room to room, and unlike the documentaries of many male artists, I rarely saw talking heads. These women were too busy to sit still for an interview. They careened around the frame, trying to balance art, children, and husbands. And in almost every case, the art survived, although the marriages did not. I sat with the other artists on the panel and gave feedback afterwards and also live tweeted. We tweeted using the hash tag #herstory6. We had been brought together by Michelle Parrish ’s HerStory project in collaboration with the Center of Green Urbanism and Sharon J. Burton, who founded Authentic Contemporary Art. Michelle led a great deal of the discussion, as Sharon had to attend to a family emergency. 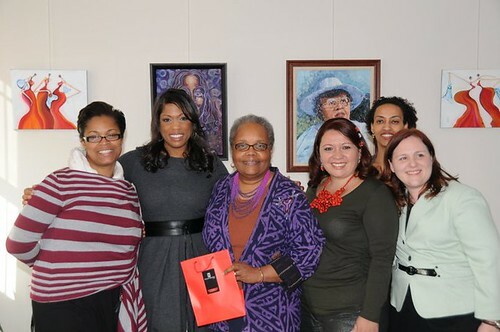 The moderator for the event was Shawn Yancy from Fox 5 news. 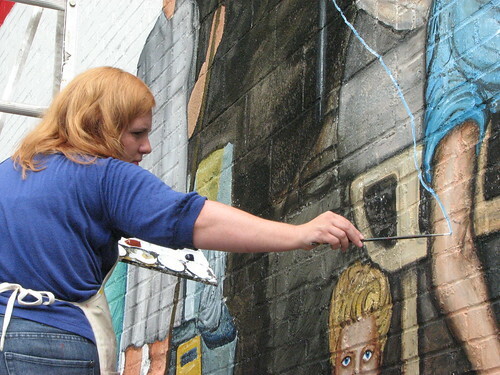 I told her the first television station to cover my mural 73 cents was the local Fox 5. The panelists being interviewed worked in three media: paint, photography and jewelry. Zandra Chesnut, co-founder of the Center of Green Urbanism, had worked for 30 years in government while raising children before she re-discovered her joy and passion for photography. Elsa Gebreyesus lived in Ethiopia, Kenya, and the United States. 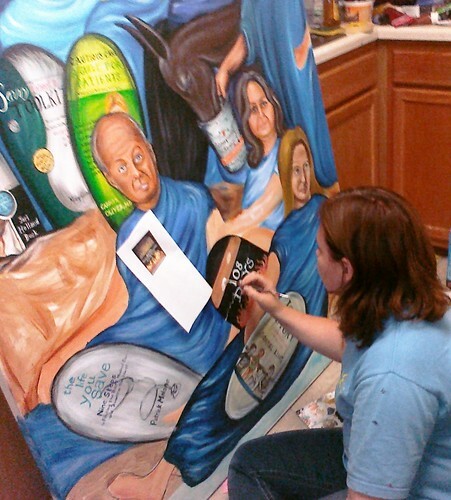 She’s been pursuing her career and her lifelong passion for art since coming to the US. In addition to her work and painting, she also volunteers with organizations involved with human rights issues, especially in Africa. The final artist was Evelyn Brooks, born in Peru. Evelyn was fortunate to work in the travel industry until a missed flight on 9-11. This life-altering event made her re-evaluate her life’s mission. In 2004, Evelyn discovered her new passion: jewelry making/design. Although Evelyn is no longer living in Lima, she travels to Peru to find inspiration and create her new collections inspired in Peruvian culture. I am very glad I got to see the documentary. It struck such a chord with me. I felt the very real anguish of the artists in the film as their lives began to spiral into sadness. They felt a call; they felt they must create and lost so much trying to fulfill their mission. I am very happy I did not have to choose between hearth and heartstrings. I rejoice that I once had a husband that shared a kitchen with paints and pots and pans. And I will never forget that he told me the title I should use if I wrote a book about our time together. 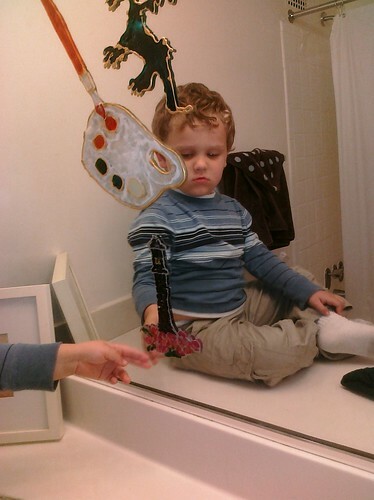 He said it should be titled There is Paint in The Oven. I often speak at conferences and hospitals throughout the United States about the care my husband received at 5 facilities in the 11 weeks he was hospitalized. And as the day progresses, I speak about my current experiences as a KP member. Some folks ask me if these things happened to my husband occurred while we were with KP. 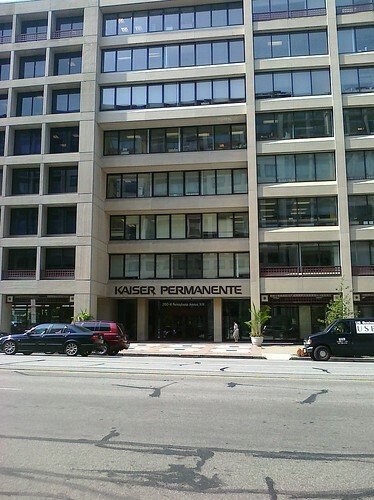 I tell them no, but because of them I joined Kaiser. When Fred died we lost his insurance. Cobra payments were over $1,000 per month so I began to shop the private insurance market. I went with KP because they had a patient portal. 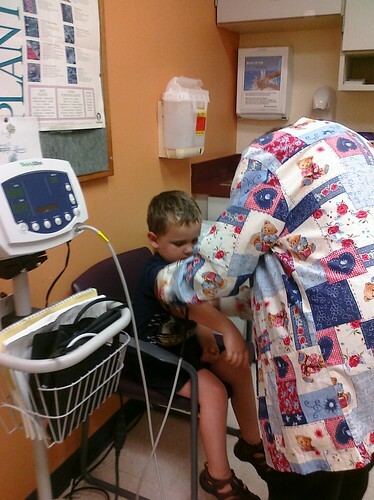 Last summer we had our first KP check-ups at West End Kaiser Permanente. It was an amazing experience. When I called to schedule our appointments, I spoke to a delightful lady at the appointment desk that gave me many choices of which days we could come in and never put me on hold. She then scheduled my labs before my appointment so I could discuss them with the doctor on the day of the physical. The labs arrived to My Health Manager patient portal and I saw them before I saw my Doctor. When I got to the appointment, the doctor was not rushed and he answered all my questions thoroughly and went through my lab results with me. Before I left the office, they made sure I scheduled an appointment with an ob/gyn as well. The real exciting stuff happened during my son’s appointments. In the past I dreaded changing our doctor, as I would have to get the shot records and I knew the old practice tended to charge for a records transfer. KP said not to worry; they had already pulled the shot record out of the District of Columbia database. Also, I dreaded having to get school forms filled-out as that was a $25 charge per form. There was no charge for that at KP. When my 11 year old, began his appointment, we discovered a record error. KP had only pulled the District Shot records and since he attends Ivymount in MD they did not have his entire record. The doctor told us we need to take some labs and we should get the record and bring it in. I scheduled the lab appointment and got a copy of the shot record to drop off. My eldest son was very stressed out about the lab work. We had rarely been able to take blood in the past without a major episode as he is on the autism spectrum. The lab tech at West End KP was very kind and helped him work through his fears. When we went upstairs to drop off the shot record, we were surprised that the nurse said we could do his needed immunizations right then and did not have to make a follow-up appointment. I was astounded and my son was scared. I find with spectrum children it is very important to prepare them for what is coming next. In the past it had required 4 adults to restrain my son while giving him his shots. It was always traumatic. But something beautiful happened at West End KP. The Doctor leaned over and looked my son in the eye and she asked him what could be done to make this experience less stressful. He looked at her a moment and said, “I like the feeling when that (blood-pressure) cuff hugged my arm. Maybe if it hugged my arm, while you gave me the shot it would not be so bad.” The doctor smiled and agreed they would try that. The nurse walked quickly away and rolled a vitals tower with pressure cuff into the room. They placed the cuff on his arm inflated it and gave him the shots. It was over in seconds and my son’s face shone as bright as the sun, as he smiled and looked at me exclaiming, “It didn’t hurt Mommy, it didn’t hurt!” He was so proud and so was I. 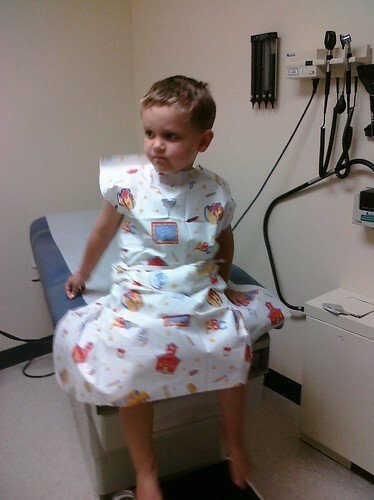 This had been the best doctor’s appointment he had ever had. And it had turned out so well because of a doctor who was willing to ask a question and to listen to the answer. That, my friend, is patient centered care. There are some brave people in this country who invite me to attend their conferences and meetings. They invite me to speak while not knowing which things I will say. They invite me to paint while unsure of what the final image will be. They know that when a patient or caregiver comes to the table the paradigm will change. And for many people, change is very scary. 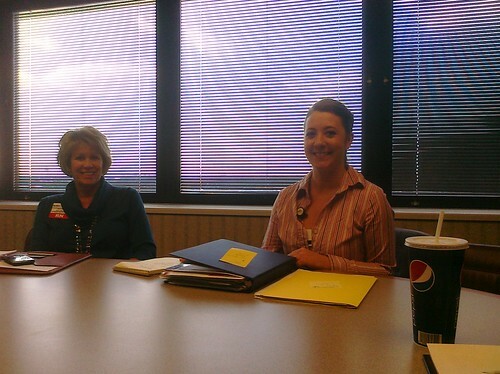 Before coming to Bellin Health, I had a conference call to discuss the upcoming event. We talked briefly about what I would paint. I explained that I paint the things that I see and hear and that can result in good images or negative images based on the words and the culture I am depicting. I could feel hesitation on the telephone line. The folks at Bellin wondered what kind of picture they would get. Would it be bright? Would it be happy? I told them, my paintings reflect the words you say channeled through an artist’s eyes. If you want a bright painting you just need to be true and genuine, I only paint the things I see and hear. There was a moment’s pause. They agreed to my onsite painting, believing their culture would show as brightly as the sun. And it did. This is Quilting Bee. The day I arrived at Bellin Health I was able to tour an allergy and asthma clinic that installed an Epic EMR system 10 business days before. I got to be privy to their last onsite meeting with the Bellin Epic installation team working in concert with the clinic staff. I often get to sit around a table and talk data and tech, but this was the first time I did that with only women present. As Anne Hale and I left the building I remarked how much the dedicated women around that table reminded me of a quilting bee. You have probably heard the word bee used this way before. It was once very common to unite a community in a common task to help each other. There were barn-raising bees, spinning bees, quilting bees and spelling bees. 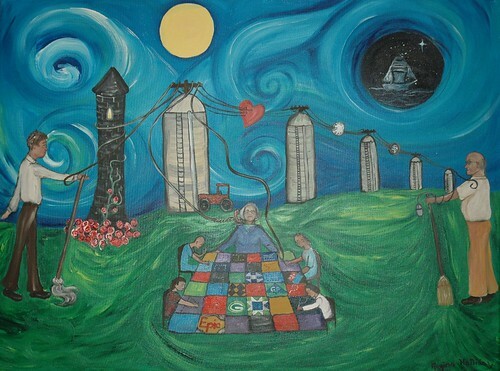 The quilters in this painting are patients, informatics professionals and doctors. They are stitching P for patient into the blocks. One patient looks in wonder at her painted nails. This image is referring to a story one of the IHI fellows told us. A young girl was asked what was the best thing that had happened while she was in the hospital. She answered, "The day they came in and painted my nails." Some blocks are quilted with the with the letters for HIT, BETTY and EMR, because that is what these quilters are building. Other blocks refer back to the slave quilt code used during the civil war. One block is a shoe-fly representing the message that this is the one you should follow. One block is the cross roads representing this is a point of decision upon the path. Another block is the North Star that points the way to freedom. These blocks create a message to patients: this is a safe place. 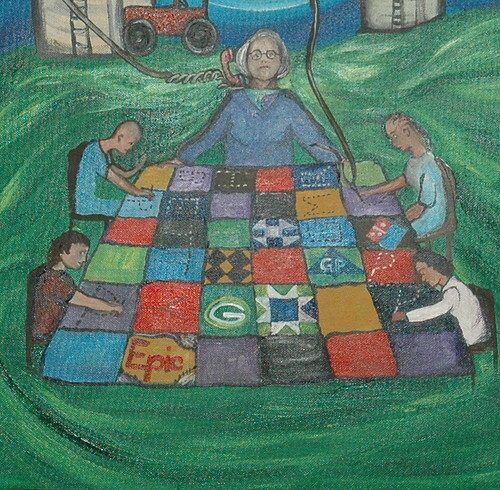 Other blocks in the quilt represent the companies that Bellin Health works with such as EPIC, The Green Bay Packers and Georgia Pacific. The square depicting the logo for Dominoes Pizza is actually alluding to their old 30 minutes or it’s free campaign. This refers to a speech given by one of the IHI fellows who mentioned that ambulances in the UK were so determined to get a patient delivered in the “right” amount of minutes, often did not deliver them to the most appropriate destination. Dominoes Pizza changed their policy because of the negative public perception of driver collisions due to the time constraints. People were injured or dying because time limit for a pizza delivery. Imagine giving up your entire motto and branding campaign, to save a life. That was the choice that Dominoes faced and it sounds like it is one the NHS is facing as well. The matriarch at the head of the quilt is Betty Bundy. She is a stroke survivor and the face of the new Epic EMR rollout at Bellin Health. The yoke of her shirt is the IHI triple aim. It is displayed upside down. When Betty was seen at Bellin no one connected the dots in her care. Later, when the stroke team began to get feedback about her experience it allowed healing to begin. The center of this painting is framed by two figures. 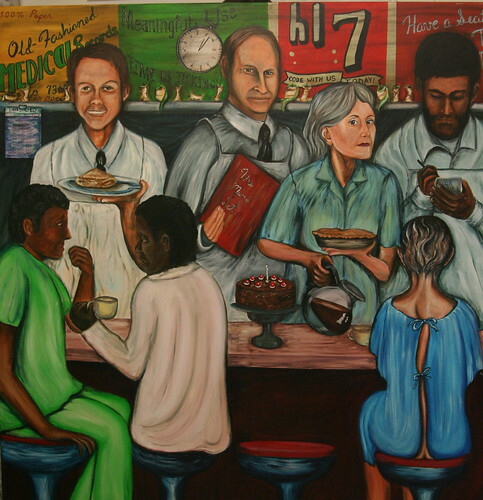 On the right side of this painting stands Everett Davis. As the conference day began I learned about Everett Davis. He worked at Bellin for 44 years. He would sweep out the stairs and everyday he would say, “Have a Good Day, My Friend.” He died on September 2, 2010. In lieu of flowers a memorial fund was created at Bellin. So, in this piece he holds his broom. On the left side, wearing clothes from the 1970’s, stands the Bellin Health CEO George Kerwin. In 1971, he started at Bellin as the head of housekeeping. He is facing Everett with a mop in hand. Both figures stand at the same level looking eye to eye across an expansive plain. Above and behind these two figures are a series of connected silos. I often hear at HIT events about the need to “tear down silos.” The Oklahoma gal in me is quite upset. We don’t want to tear down silos. Silos are important. They store grain before transport. We need to connect the silos. So, out of each of these silos a telephone pole rises above and transmits data. The wires themselves suspend and pierce three items and wrap around the figures in the scene. One item is a heart. It represents the love we feel for families and heartache we feel watching patients suffer in pain. Next is a clock. Ann Hale mentioned in her speech that as we bring patients into councils and work groups it is very important that we respect their time. Finally, there is the compass that alludes to the North Star above it. During the afternoon session Linda Roethle and Randy Ronsman spoke about the new partnership between Bellin Health and NorthStar. The NorthStar group spent a year looking at options and navigating the waters of care and decided a partnership with Bellin would help patients in both geographic regions. The wires then extend out and connect George Kerwin and Everett Davis. One coils down to Betty Bundy and allows her to communicate by phone with the Bellin Health stroke team. The final wire becomes the thread that allows the quilt to be to be connected in the health information exchange. The Silos end in a Dark Tower. This symbolizes the Beam Project. On March 10th I met with Nan Bush from the Bellin Foundation and Allison Gyrzen from the Bellin’s Cancer Team and the Beam Project. Allison has a degree in art education and works at Bellin creating and implementing an arts for healing program called the Beam. As she described the mosaic work the patients and family members have created as they work their way through recovery, healing or grief, I thought of Fred. I thought of the window stickers we had made with him to adorn the windows of his room. The light shown through those stickers as if they were stained glass, they helped make a clinical room sacred. We had painted things that would make Fred happy. Fred was a huge Stephen King fan and his favorite tale was the Dark Tower. Thank you Bellin Health for inviting me to Green Bay, Wisconsin. I will spread your tale far and wide. Everything happens for a reason. And Stephen King was right, all things do indeed serve the Beam. I think about patient access to the electronic medical record often. I might even be called a Meaningful Use Groupie. I have heard David Blumenthal expound so often on this subject that I have memorized elements of his speeches. But when I think of Data access, core measures and menu sets, I see pictures of diners and data. Often those pictures can illuminate or disturb. Sometimes they do both. 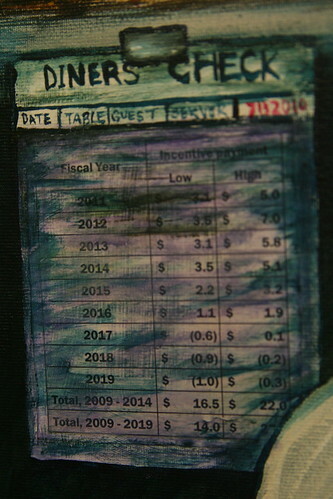 The painting The Menu Set reflects a lot of my thoughts on Meaningful Use after speaking with organizations affected by it. This is a very divisive composition. It has a right side focused on the patient and the left side that focused on providers. To the right of center is an image of Secretary Kathleen Sibelius dressed as a waitress. Her gaze is riveting and concerned. Her face is incandescent. She is the mother and the mage. She is the servant and the leader. Her eyes capture the viewer with a piercing gaze, seemingly asking each of us, “What are you doing to help?” I have talked with Kathleen about patient centered care and I have talked with her about the best way to pack dresses when traveling to speaking events. She is equally conversant on both topics. She is one of us and knows that for medicine to change we must serve the customer. 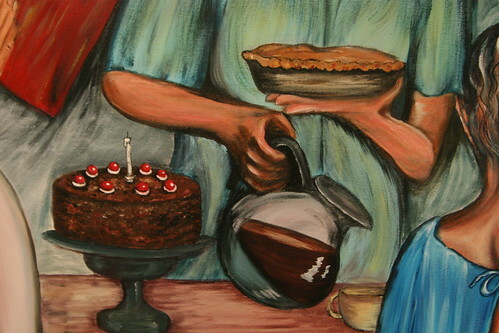 In her right hand Kathleen holds an apple pie before a patient guest. Behind her on a long stainless steel shelf, are 15 apple cores. Those 15 apples are the main ingredients for the pie. These are the core measures and this is Meaningful Use. In her left hand she prepares to pour coffee. Here is coffee – a stimulant. Here is HITECH and stimulus funding. And she is doing all of this for the customer, the patient. Beside Kathleen is David Blumenthal, MD. During Stage One Meaningful Use David was a driving force for adoption as the leader of the Office of the National Coordinator for Health Information Technology. David is dressed as a cook and a manager and in his hand is the Menu Set: a menu of additional requirement from which 5 must be chosen. David’s gaze is fixed as if looking at some far off goal. I had seen this fixed gaze before in Chicago at American Academy of Ophthalmology 2010 Joint Meeting. Synopsis Incentive payments for adoption of electronic health records (EHRs) provide up to $44,000 over 5 years per physician. Starting in 2015, if you have not adopted certified EHR and demonstrated meaningful use, you will receive a reduction in Medicare payments. Past certifications for EHRs do not qualify for automatic certification; they need to be certified under a new certification program. Physicians need to meet EHR functionality measures and clinical quality measures. Our speakers will address exactly what you need to do to qualify for these incentive payments and what you need to watch out for in Stage 1. David Blumenthal, MD, the Department of Health and Human Services’ national coordinator for health information technology (HIT), will speak during this FREE session. Dr. Blumenthal leads the Obama administration’s implementation of a nationwide, interoperable, privacy-protected HIT infrastructure that was established in last year’s stimulus bill. The session will also feature Derek Robinson, MD, CMS Region 5 chief medical officer and physician liaison for quality/HIT initiatives. I had been invited to attend this event by the really nice folks at OA systems an EMR Company that specializes in e prescribing. (Full disclosure: they did pay for my travel to Chicago, lodging, babysitting and an honorarium for my speech the day before.) I sat in this Grand Ballroom beside Brian Ahier, a fellow speaker and rather famous HIT evangelist and Omar Ahmed, the CEO of OA Systems. Do you notice how many times the words referring to payment, incentives or money were used in the paragraph above? Did you see the title? 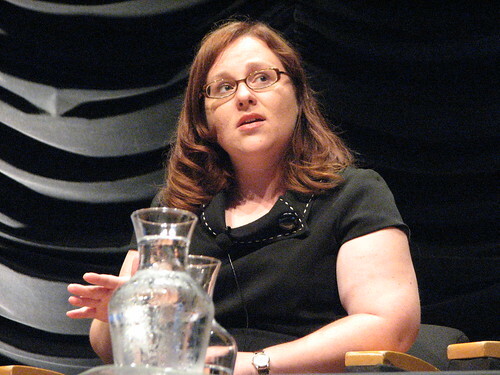 The meaning of Meaningful Use is incentive payments? I was aghast. The meaning behind Meaningful Use is the patient story and patient centered care. David Blumenthal faced a room full of angry specialists demanding a higher ROI. At one point the entire room burst into a thunder of applause as a question was raised about when past CMS incentives would be paid. David Blumenthal responded to their anger with a level gaze and defended Meaningful Use concepts such as checking vitals as life saving measures. He said “You maybe the only Doctor who sees this patient in a long time. If you notice he is suffering from dangerously high blood pressure you could save his life.” I began to clap after David said this. In that room of 1,000 people, I clapped in silence and looked into David’s far-seeing gaze. To Kathleen’s right stands Omar Ahmed himself. He is taking the patient’s order; he is trying to provide service. In his hand he holds a small mobile device and is entering the order with a stylus. His head is bowed with respect and concentration. For this is how I saw OA Systems in the long day on the exhibition hall floor in Chicago. As many other EMR booths contained all the sincerity of a used car lot, OA systems staff were quietly answering questions and asking for patient input. Before the Trio of David, Kathleen and Omar sits a patient. She is thin and ill. Her gown gapes open and you can see a skeletal back and her bare buttocks rest on the vinyl-covered stool. She has no face and she has no name. She represents all of us desperately trying to get care. Where are her arms and hands? Are they bound? Are they raised in prayer? We do not know because we cannot see this data mote in the system. Her unique identifier has been removed and the painting is HIPPA compliant. So this is Cerner, and this waiter is Clay. He is trying to give an apple turnover to the two medical professionals. If you look closely at the plate you will see the Cerner logo is part of the plate design. The two Doctors are deep in a worried conversation and do not look up. Clay has decided to look above them and communicate with an audience of end-users directly. This a company that invites me to speak for 45 minutes at a time about the failings of a medical system that does not allow patients to have a portal to their own records. This is a company that names a soccer field LIVESTRONG. This is about a man named Clay who walks me through product demos, while at home his step-mother is suffering from Cancer. I am very thankful of the time I spent with Clay and the folks at Cerner. I am grateful for the information I learned from them about back channel support for patient portals. They are the first company that told me about the ability to have a visual avatar on every EMR, and that any hospital could turn on that function. All the CMIO had to do was pick that function on the Menu. Behind the two patrons and wait-staff are a series vintage signs. They advertise many things. You can get old-fashioned 100% paper medical records for only 73 cents per page. 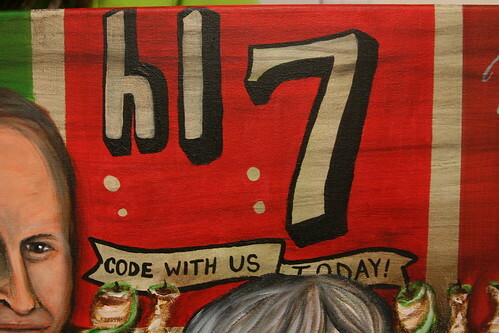 Or perhaps you would like a refreshing draught of HL7 coding? Don’t know about HL7? As wikipedia defines it “HL7 is an international community of healthcare subject matter experts and information scientists collaborating to create standards for the exchange, management and integration of electronic healthcare information.” It is sort of like an international quilting bee working on informatics and standards. In front of all these signs, are those apple cores I mentioned earlier. And here is where disturbing really kicks in. My 12 year-old son Freddie thought they were rats or mice. Only upon closer glance did he see the cores. Even the cores are disturbing. These are the cores, the leftovers. This is what remained after months of pairing away to reach the final rule of Stage One Meaningful Use. A lot got left out to make the pie, as we head to stages 2 and 3 it is very important that people demand that patient access stay in the recipe. And to the far left of the shelf hangs a diners’ checklist: the entire timetable through 2019 of incentive payments for Meaningful Use. Note how this check is pushed to the side and is in darkness. 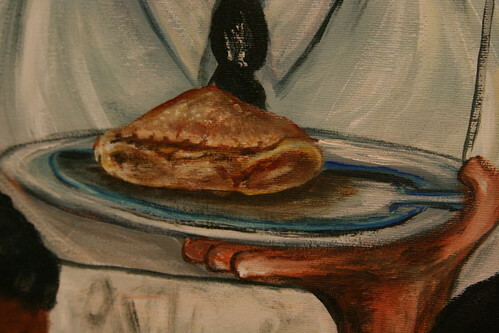 In the center of this painting is another dessert. You can eat cake. Do recognize that cake? That, my friends, is the Portal cake from the blockbuster computer game created in 2007. I have a 12 year old and long before I spoke about EMR systems and patient portals, I was talking about another kind of portal with my son. 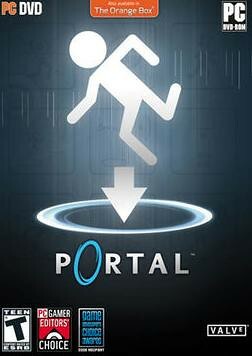 In this game the character Chell must break through layers using a portal gun that allows her to transport herself. All the while the somewhat insane AI: GLaDOS heckles Chell while she attempts to solve puzzles. Failure in solving these puzzles will result in death. GLaDOS assures Chell that if she succeeds she will get cake. The game progresses and the taunts become more vicious, such as, “You've been wrong about every single thing you've ever done, including this thing. You're not smart. You're not a scientist. You're not a doctor. You're not even a full-time employee. Where did your life go so wrong?” Along the path Chell realizes the cake is a lie. The promised reward is not cake, and the goal of the game is not to solve a puzzle, the goal is to live another day. That is a big deal. Timely access to personal health information can make all the difference to patients throughout the world. And to all those out there who think Meaningful Use is just about incentive payments, The Cake is a Lie, my friend. This game is not about money.